Adequate reporting of adaptive designs (ADs) maximises their potential benefits in the conduct of clinical trials. Transparent reporting can help address some obstacles and concerns relating to the use of ADs. Currently, there are deficiencies in the reporting of AD trials. To overcome this, we have developed a consensus-driven extension to the CONSORT statement for randomised trials using an AD. This paper describes the processes and methods used to develop this extension rather than detailed explanation of the guideline. Writing-up and dissemination of the E&E document. The CONSORT Executive Group oversaw the entire development process. Delphi survey response rates were 94/143 (66%), 114/156 (73%), and 79/143 (55%) in rounds 1, 2, and across both rounds, respectively. Twenty-seven delegates from Europe, the USA, and Asia attended the consensus meeting. The main checklist has seven new and nine modified items and six unchanged items with expanded E&E text to clarify further considerations for ADs. The abstract checklist has one new and one modified item together with an unchanged item with expanded E&E text. The E&E document will describe the scope of the guideline, the definition of an AD, and some types of ADs and trial adaptations and explain each reporting item in detail including case studies. We hope that making the development processes, methods, and all supporting information that aided decision-making transparent will enhance the acceptability and quick uptake of the guideline. This will also help other groups when developing similar CONSORT extensions. The guideline is applicable to all randomised trials with an AD and contains minimum reporting requirements. Clinical trials are expected to adhere to high ethical and scientific standards and answer research questions robustly, as quickly as possible to benefit patients, and use no more research resources than necessary. The need to streamline the conduct of trials is a cross-sector (public and private sector) and regulatory priority [1–6]. Well-designed and properly conducted adaptive design (AD) trials can improve the efficiency of clinical trials and help achieve these objectives. There is a growing interest in ADs across sectors to address the shortcomings of trials with a fixed design. Furthermore, there is considerable statistical methodological literature on ADs [7, 8] and new methods continue to be developed. Discussions on opportunities to use ADs across trial phases and advice on their robust design and conduct are growing [9–17]. Different types of ADs are increasingly used or at least considered at the design stage across sectors [18–25]. However, ADs have a number of issues and challenges. There is lack of practical knowledge of ADs, and some obstacles and concerns about some types of ADs are impeding their use [22, 26–32]. Access to case studies of AD trials may help alleviate some of these problems [28, 33]. Consequently, authors have reviewed real-life AD case studies to build knowledge resources [18, 19, 34, 35]. Although these reviews found a number of AD case studies, especially in oncology, many of these trials are inadequately reported and thus may not address some of the concerns about ADs [18, 33, 36]. Adequate reporting will improve the credibility and interpretability of ADs and increase their application [28, 34]. The Consolidated Standards of Reporting Trials (CONSORT) framework has been instrumental in promoting transparent reporting of randomised trials. Increased complexity of the trial design and conduct, as is common in AD trials, comes with additional transparency and reporting demands. The CONSORT 2010 statement  includes the concept of changes to the trial design and methods after commencement without differentiating between planned adaptations and unplanned changes (item 3b) and interim stopping rules (item 7b). It does not, however, specifically address the general reporting needs for randomised trials that use an AD. As noted above, reporting deficiencies of AD trials have been highlighted [18, 23, 33–35] and it has been suggested that there is a need for additional reporting considerations to address this [33–35, 38]. However, these papers lack a grounded methodological approach to developing comprehensive reporting guidance. Thus, the suggested piecemeal recommendations are likely to be incomplete and unlikely to be accepted to influence practice because they lack input from important stakeholders through a robust process. 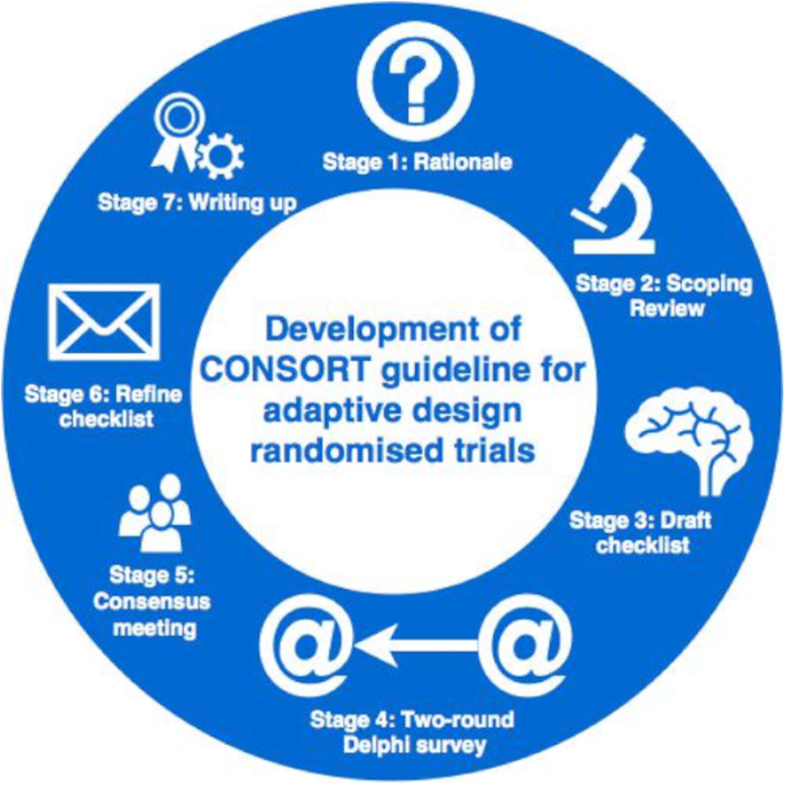 Therefore, this project aimed to address this limitation by using a recommended consensus-driven framework  to develop an official reporting guideline, Adaptive designs CONSORT Extension (ACE), for randomised trials that use ADs. In the spirit of good reporting practice, this paper describes the processes and methods that the ACE Steering Committee (SC) used to develop a consensus-driven ACE reporting guideline. We provide justification for the decisions made to arrive at the final checklist and explain the structure of the forthcoming ACE explanation and elaboration (E&E) document. Box 1 lists the long-term objectives of the ACE project. A favourable ethical approval for this study was granted by the Research Ethics Committee (REC) of the School of Health and Related Research (ScHARR) at the University of Sheffield (ref: 012041). The guideline development process adhered to a consensus-driven methodological framework for developing healthcare reporting guidelines recommended by the CONSORT Executive Group . An a priori registered protocol accessible via the EQUATOR Network  guided the conduct of this research, and Fig. 1 summarises the development process. A multidisciplinary SC of 19 members from industry and the public sector, including the CONSORT Executive Group representative (DA) and members of the MRC Network of Hubs for Trials Methodology Research (HTMR) Adaptive Designs Working Group (ADWG), led the guideline development process. The members were based in Europe, USA, and Asia. The professional experience of members included methodology and conduct of AD trials, management and conduct of randomised trials, regulatory assessment and approval, reviewing research grant applications and decision-making on research funding panels, systematic reviewing of evidence, and development of reporting guidelines. This composition was motivated by the need to capture diverse views of experts across sectors with multidisciplinary roles in trials research covering wide geographical locations. A Study Management Group (SMG) comprised of thirteen SC members oversaw the day-to-day project activities in consultation with the SC. For quality control, we sought the advice from an External Expert Panel of four members based in the USA, UK, and Australia—with practical and methodological expertise in AD trials during the drafting process of the version of the checklist to be included in the Delphi surveys. Additional file 1 summarises the project activities undertaken throughout the development process. The findings from a National Institute for Health Research (NIHR) Doctoral Research Fellowship (DRF-2012-05-182) led by MD and supervised by SJ, ST, and JN informed the need for this research . The idea was presented, discussed, and contextualised at the 2016 annual workshop of the MRC HTMR ADWG attended by six members of the ACE SC (MD, TJ, PP, JW, AM, and CW). In summary, research prior to 2016 investigated obstacles and potential facilitators to the use of AD trials [22, 26, 28–32, 41] as well as deficiencies in their reporting [18, 23, 33, 34]. Further research highlighted the overwhelming need for a tailored reporting guideline for AD trials with literature suggesting some reporting principles [26, 28, 33–35, 38]. We approached the CONSORT Executive Group in 2016 informing them about our plans for the ACE guideline, and they agreed to oversee the development process. Before the research began, we further performed a scoping free text search on 10 October 2016 using the term ‘adaptive’ on the EQUATOR Network database , but we found no reporting guideline on ADs or related guideline under development. The objectives of the scoping narrative review were to collate any concerns about AD trials or considerations that may influence their reporting, to identify any suggestions on how AD trials should be reported and to establish definitions of technical terms. The aim was to guide the preliminary drafting of the reporting items and working definitions for the extension checklist. The review also helped us to create a list of authors who had published AD trials or methodology research as potential participants for the Delphi surveys. The literature search was not intended to be exhaustive but to provide a good foundation for the guidance development process. We searched the MEDLINE database via PubMed on 17 November 2016 for any articles about randomised AD trials written in English using this combination of terms: ((“adaptive design”) OR (“adaptive clinical trial”) OR (“adaptive trial”) OR (“adaptive interim”) OR (“flexible design”)) AND (reporting OR recommendation* OR (“best practice”) OR (“good practice”) OR (“panel discussion*”) OR guidance OR guideline* OR interpretation OR bias OR (“expert opinion”) OR (“expert panel”)). We retrieved 237 articles, from which we excluded 51: 33 were ineligible (irrelevant to the subject or about non-randomised studies), 16 inaccessible, one duplicate, and one had an English abstract but was written in Chinese. We narratively reviewed 186 eligible publications, and key ones are cited in relevant sections. We also reviewed some additional key documents that we were aware of but that were not retrieved by the search strategy, such as regulatory reflection guidance [4–6]. We summarised the findings and drafted a preliminary checklist in preparation for our first face-to-face SC meeting. On 29 January 2017, the SC met in Sheffield for a full day to discuss the findings from the scoping review, agree upon a working definition of an AD trial, and to discuss the preliminary extension checklist in the context of the concerns about AD trials and what necessary changes should be made to the CONSORT 2010 checklist. What do we consider an adaptive design trial? By pre-planned, we envisaged trial changes or adaptations are specified at the design stage or at least before any unblinded review of the accumulating trial data, and they are documented in an auditable trial-related document such as the trial protocol. We acknowledged the existence of flexible statistical methods to cope with unplanned trial changes under specific conditions . However, we strongly feel that pre-planning is one of the necessary conditions to preserve the integrity of the trial, a view shared with regulatory guidance [4–6]. Thus, this guideline is not meant for trials with unplanned changes only (no planned adaptations). For the scope of this guideline, changes to aspects of an ongoing trial that solely depend on external information rather than accumulating trial data are outside the scope of what we consider an AD trial. Furthermore, we specifically exclude the use of accruing trial data to make changes that relate only to the feasibility and process aspects of conducting a trial, which forms part of almost every trial. We refer to these changes as operational adaptations . The types of ADs and trial aspects that can be modified are discussed in the literature [3, 9, 11, 15, 16, 24, 41, 48–53]. By validity, we meant the ability to provide correct statistical inference to establish the effects of the study interventions and produce accurate estimates of the effects (such as point estimates and associated uncertainty) to give results that are convincing to research consumers. Finally, the use of the word integrity pertains to minimisation of operational bias, maintenance of data confidentiality, and consistency in trial conduct for credibility, interpretability, and persuasiveness of trial results. Our definitions of terms relating to ADs are listed in Additional file 2. What are the concerns for adaptive design trials? The review found some key publications that discussed why the reporting of AD trials requires special consideration and reporting suggestions or recommendations for particular types of AD trials [23, 25, 33, 34, 38, 45, 51, 53–61]. ADs are not immune to potential biases and limitations despite their appealing nature and promising benefits [9, 50, 53]. Box 2 summarises the concerns or considerations that influence the reporting of ADs into eight themes that may depend on the type of the AD and scope of the trial adaptations used. These themes explain why the reporting of AD trials requires special consideration, and they influenced the development of the ACE guideline. The SC then discussed the preliminary extension checklist drafted during the scoping literature review focusing on what changes need to be made and the structure of the changes with justification. We classified items as ‘no changes proposed’, ‘modifications proposed’, and ‘new item suggested’. A report summarising the discussions is accessible online (see download at https://doi.org/10.15131/shef.data.6139631). Following the first face-to-face meeting in Sheffield, the checklist was then redrafted and refined during an iterative process through subsequent face-to-face and teleconference meetings and email correspondence involving the SMG and the SC. The External Expert Panel reviewed the draft checklist and working definitions of technical terms. We added two specific items on how to deal with overrunning participants (12e) and multiple outcomes or multiple treatment comparions (12f), which were suggested by the panel (see download at https://doi.org/10.15131/shef.data.6198290). The panel also suggested a rewording of some items for clarification and identified specific aspects that should be addressed in the E&E document. In addition, independent experts were consulted to review the draft checklist to identify major problems with content and wording of items. On 5 May 2017, the SC finalised the official first draft of the extension checklist with a total of 58 items. This list included 22 new items, 15 modified items, and 21 items unchanged from the CONSORT 2010 checklist. This draft checklist is accessible online (see download at https://doi.org/10.15131/shef.data.6198290). We aimed to engage key stakeholders across sectors and over wide geographical locations. We targeted those with AD-related experience including clinical trialists, clinical investigators, statisticians, trial methodologists, and health economists; those interested in using ADs; and consumers of research findings, decision makers, and policy-makers in clinical trials research including journal editors, systematic reviewers, research funders, regulators, research ethicists, and patient representative groups. We created a list of 468 authors of the AD-related publications (trials or methodology) from our review and known case studies [18, 34]. This list contributed to the majority of the survey sampling frame. The details of organisations or professional groups we also approached are accessible online (see download at https://doi.org/10.15131/shef.data.6291050). We used a wide range of platforms to reach out to key stakeholders of interest such as targeted mailing lists, social media, and personal communications (see Additional file 3). The National Perinatal Epidemiology Unit (NPEU, University of Oxford) built and hosted the online Delphi surveys and offered administrative support to maintain the anonymity of participants’ responses. The SC including the lead investigator and study coordinator did not have access to any information that could link participants to their responses during and after the survey. The objective of the Delphi process was to assess the stability of opinions that can be viewed as consistency in ratings of importance between rounds and not merely to reach consensus. We expected two survey rounds would suffice to reach stability in perceptions based on recent similar studies [62, 63]. However, the methodology permitted the SC the flexibility to undertake a third round if necessary based on the results and feedback received in round 2. We used an importance rating scale of 0 to 9 adopted in related Delphi surveys [62–64]: ‘not important’ (score 1 to 3), ‘important but not critical’ (score 4 to 6), ‘critically important’ (score 7 to 9), and ‘do not know’ (unsure). We used the same scoring system across rounds and indicated whether items were new (N), modified (M), or remained unchanged (U) from the CONSORT 2010 checklist . See Fig. 2 for a screenshot. We registered stakeholders who were willing to take part with informed consent via a bespoke web-based platform. During registration, we obtained informed consent and gathered demographics and characteristics of participants such as geographical location, self-identified stakeholder group (clinical trials user, clinical trialist, or methodologist), employment sector, years of experience in trials research, and AD-related research experience. Registered participants were sent personalised emails with a link to the round 1 survey. The landing survey page stated the ACE project aims, the contextual definition of an AD trial, and the scope of the guidance. We asked participants to rate their perceptions about the importance of the suggested reported items. Unchanged items were included to allow participants to provide comments and assess completeness of the proposed extension checklist when completing the survey. We provided participants with the opportunity to give item-specific and general open-ended feedback such as any potentially overlooked modifications or clarity issues. We activated the round 1 survey on 31 May 2017 and gave participants approximately 3 weeks to complete it. Between rounds 1 and 2, we re-opened registration and extended recruitment to specifically target journal editors using a similar process as described for round 1. All registered participants were eligible to complete round 2 unless they withdrew consent. In round 2, participants who completed the round 1 survey were presented with their own previous item rating scores and the distribution of the item rating as displayed in Fig. 3 (including medians and interquartile ranges (IQRs) of all participants (green) and their self-identified stakeholder group at registration (blue)). We did not display previous data for participants who only completed the round 2 survey. We asked participants to rate the importance of 38 new or modified items as compared to the CONSORT 2010 checklist. Item 21 (generalisability) from round 1 was unintentionally overlooked and not included in the round 2 survey due to a technical error (see download at https://doi.org/10.15131/shef.data.6198290). Items 14a (dates defining the periods of recruitment) and 14b (unexpected termination/why the trial ended or stopped) were modified for reasons stated in Additional file 4. We asked participants to give open-ended feedback including any reasons for changing their ratings where applicable. 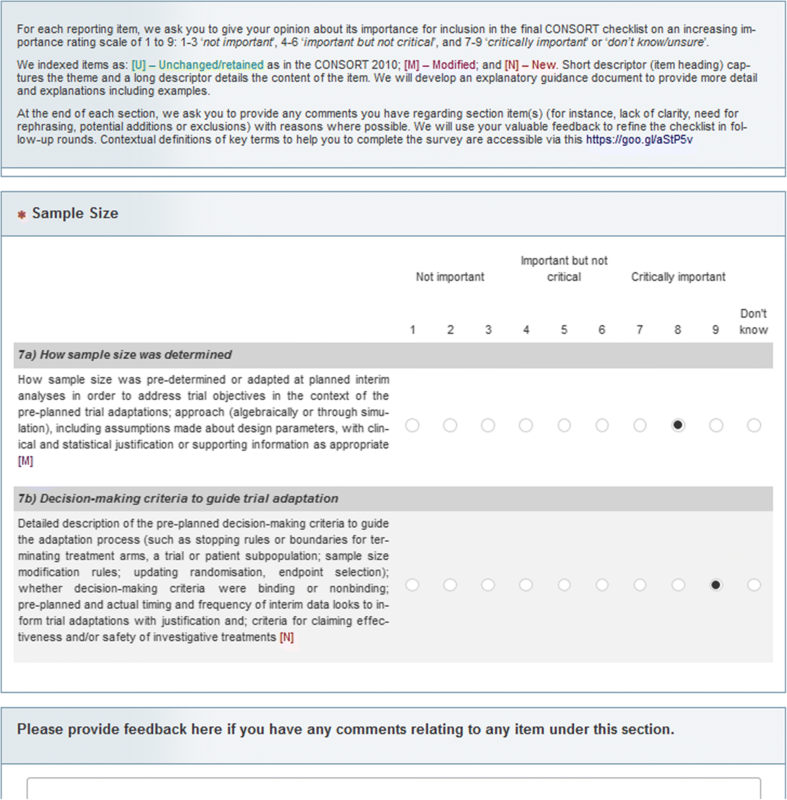 The survey also displayed unchanged items from the CONSORT 2010 checklist and asked participants to provide any additional feedback without rating these items. The main and abstract draft checklist used for round 2 are accessible online (see download at https://doi.org/10.15131/shef.data.6198347). We launched the round 2 Delphi survey on 15 September 2017 and gave participants approximately 4 weeks to complete it. We predefined consensus as receiving the support of at least 70% of responders rating an item as ‘critically important’ for inclusion in the round 2 Delphi survey [40, 66]. Prior to the consensus meeting, we specified that the decision to retain an item should be based on achieving at least 50% support of delegates voting to ‘keep’ an item . These criteria in consideration with the feedback gathered informed the SC in making the final decisions about reporting items to be included in the ACE guideline. Primary role in clinical trials research as a statistician (yes or no). We summarised the number and proportion of participants who rated an item as ‘not important’, ‘important but not critical’, and ‘critically important’, including the ‘do not know’ category. We analysed qualitative feedback gathered during the Delphi surveys using a simple thematic analysis  to identify common comments and elucidate feedback on suggested items (new or modified) as well as gather additional content suggestions for the checklist. Bland-Altman plots  and histograms of changes in the scores between rounds. The SC reviewed the open-ended feedback received to inform the development process, such as modification of items for clarification and testing the wording of items. 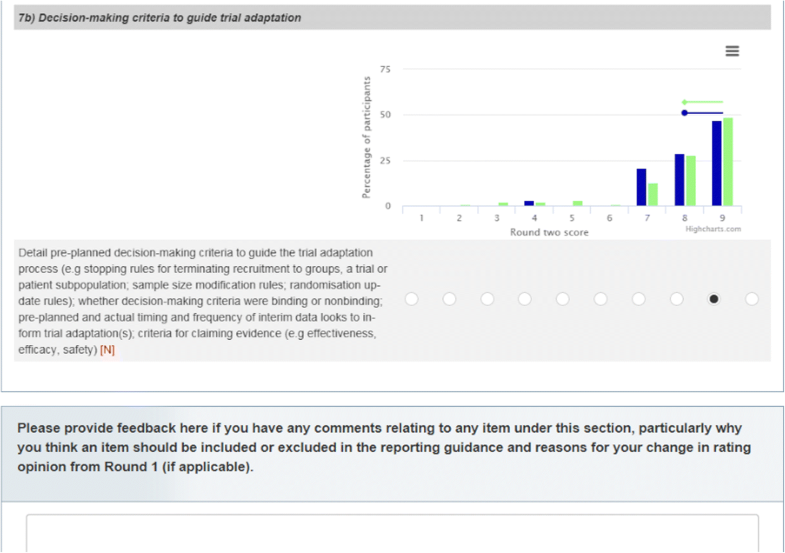 For instance, in round 1, we tested the preference of two additional versions of item 14c adaptation decisions (14d pre-planned adaptation decisions and 14e deviations from pre-planned adaptation decisions, see download at https://doi.org/10.15131/shef.data.6198290). The wording of items and structuring of the checklist evolved during the process. The aim of the consensus meeting was to discuss the round 2 Delphi survey results; to make advisory decisions on items to retain in the guideline through voting, including reasons for supporting decisions; and to suggest reporting aspects that should be addressed in the supporting E&E document. We held a full day meeting on 8 November 2017 in London attended by 27 delegates from the UK, USA, Europe, and Asia. Delegates from the public sector and industry included clinical investigators, trial statisticians, journal editors, systematic reviewers, funding panel members, methodologists, and the CONSORT Executive Group representative. Professor Deborah Ashby was the independent chair of the meeting. We took notes during the meeting and audio-recorded and transcribed the discussions to ensure that the content was accurately captured. Following the discussion of each checklist item or group of checklist items, we asked delegates to anonymously vote about the inclusion of a specific item; ‘keep’, ‘drop’, and ‘unsure or no opinion’. We also included the item-voting preferences of a 28th delegate who was unable to attend in person but provided their ratings of checklist items remotely and the project support administrator voted on their behalf. Twenty-six delegates voted, with EC and the independent chair excluded from voting to maintain the independence of the process. In round 1, we registered 143 participants, 94 (65.7%) completed the survey. Of these 94, 86 (91.5%) rated all 58 items and the remaining 8 (8.5%) rated 45 items or fewer. We registered an additional 13 participants after round 1, bringing the total registered participants in round 2 to 156. The round 2 response rate was 114/156 (73.1%). Of these 114, 110 (96.5%) rated all 38 items and the remaining 4 (3.5%) rated 22 items or fewer. Excluding 13 participants who were only registered after round 1, 79/143 (55.2%) completed both round 1 and 2 surveys. Of the 114 round 2 responders, 35 (30.7%) did not complete the round 1 survey. Additional file 5 presents the demographics and characteristics of registered participants and responders (completers of at least one reporting item in at least one round). Registered participants and responders were very similar across rounds. Responders in rounds 1 and 2 were based in 19 and 21 countries, respectively; the majority were from the UK, other European countries, and the USA. The majority of responders identified themselves as statisticians in their primary role in trials research; other prominent roles were clinical investigators and trial methodologists. However, the secondary roles in trials research were more diverse. Some stakeholder groups including regulatory assessors, health economists, and research ethicists were underrepresented. Over two thirds of responders were from the public sector. Responders had diverse AD-related experience, and most identified themselves as clinical trialists or methodologists. Additional file 6 summarises the distribution of the responders’ perceptions of the importance of reporting items. Detailed item descriptors are accessible online (see download at https://doi.org/10.15131/shef.data.6198290). Of the 22 new items, 11 (50.0%) and 17 (77.3%) were perceived as critical for inclusion by at least 70% and 50% of responders, respectively. Except for one modified item (15a—appropriate baseline data for comparability), which was rated as critical by only 62.9% of responders, the remaining 14 modified items were rated as critical by at least 70% of responders. 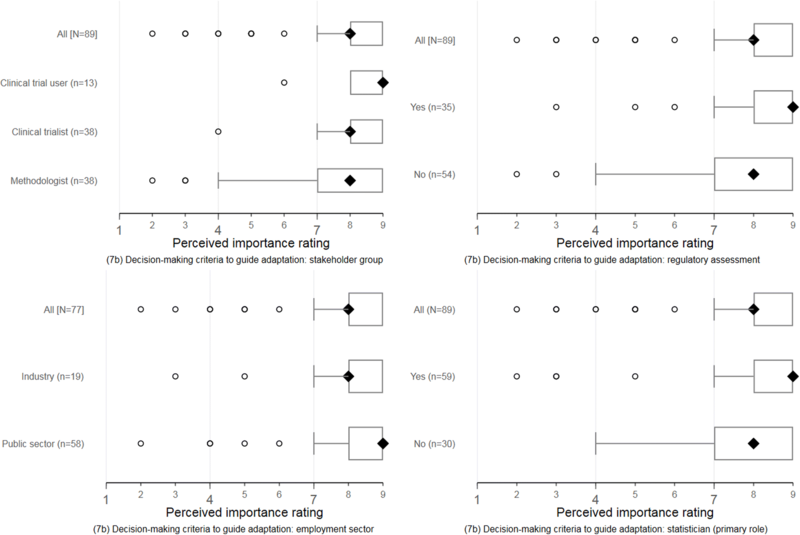 The perceptions of responders about the importance of suggested reporting items were broadly consistent across self-identified stakeholder groups, employment sectors, regulatory assessment experience, and statistical primary role. Figures 4 and 5 display these response patterns for two reporting items selected for illustration. The remaining clustered boxplots for the new or modified items are accessible online (see download at https://doi.org/10.15131/shef.data.6139721.v1). On 3 July 2017, the SC met face-to-face to discuss the round 1 Delphi survey results. The summary of the open-ended feedback we received is accessible online (see download at https://doi.org/10.15131/shef.data.6139631). Some responders highlighted that the guideline does not cover ADs used in non-randomised studies. However, we intentionally restricted the scope of the guideline to randomised trials to conform to the scope of CONSORT 2010 framework and to avoid additional complexities. We suggest a separate reporting guideline specific to non-randomised ADs commonly applied in phase 1 trials. In the feedback, some responders were concerned that the draft checklist included little about aspects relating to Bayesian AD trials. The SC had thought about this at the planning stage and decided to make this guideline as general as possible and applicable to all AD randomised trials regardless of whether they were designed and analysed using frequentist, Bayesian, or both statistical paradigms. The E&E document will further discuss the scope of the guidance and illustrate reporting using examples of various frequentist and Bayesian randomised trials that use an AD. In general, the qualitative feedback acknowledged that the first checklist draft was comprehensive. However, some responders felt that there were too many items which may impede the use of ADs. The feasibility of reporting all aspects due to limited journal space was questioned although this should no longer be a barrier to complete reporting due to the availability of online repositories. However, the SC deliberately included a large number of draft items at this stage of the Delphi survey to gather perceptions about their importance. The aim of the Delphi process and the subsequent consensus meeting was then to help the SC to decide on essential items to retain. Some responders suggested the need to include aspects of an estimand of interest, such as under item 2b (specific objectives and hypotheses). The SC acknowledge that the importance of estimands is growing [71–73]. It was felt that estimands are applicable to every trial, and therefore, we recommended via the CONSORT Executive Group representative that such a modification should be considered as a general amendment to the standard CONSORT 2010 when it is revised. Additional file 4 summarises some of the SC’s responses to responders’ qualitative feedback. Additional file 7 presents the summary of item ratings of round 2 survey responders for new and modified items. See download at https://doi.org/10.15131/shef.data.6198347, for the detailed description of items for the main and abstract draft checklists used in round 2. For the abstract checklist, 65.8% of responders rated a new item on ‘adaptation decisions made’ as critical for inclusion (Additional file 7). The remaining four modified abstract items were rated as critical by at least 70% of responders. The overall distributions of ratings were relatively similar across these five abstract items. For the main checklist items (Additional file 7), more than 70% of responders perceived 25/33 (75.2%) of the new or modified items as critical for inclusion, including 18/33 (54.5%) that were rated as critical by more than 90% of responders. Only 4/33 (12.1%) items received less than 50% votes for being critical: contribution to future research (22b), simulation protocol and report (24d), data monitoring committee charter (24e), and statistical code (24f). However, these items were perceived as at least important by more than 80% of responders. The remaining four items were perceived as critical by between 60% and 68% of responders: dealing with overrun trial participants (12e), representativeness of patient population (15b), access to intentionally withheld information during trial conduct (24b), and access to the statistical analysis plan (24c). As in round 1, the perceptions of responders about the importance of suggested reporting items were broadly consistent across self-identified stakeholder groups, employment sectors, regulatory assessment experience, and statistical primary role. 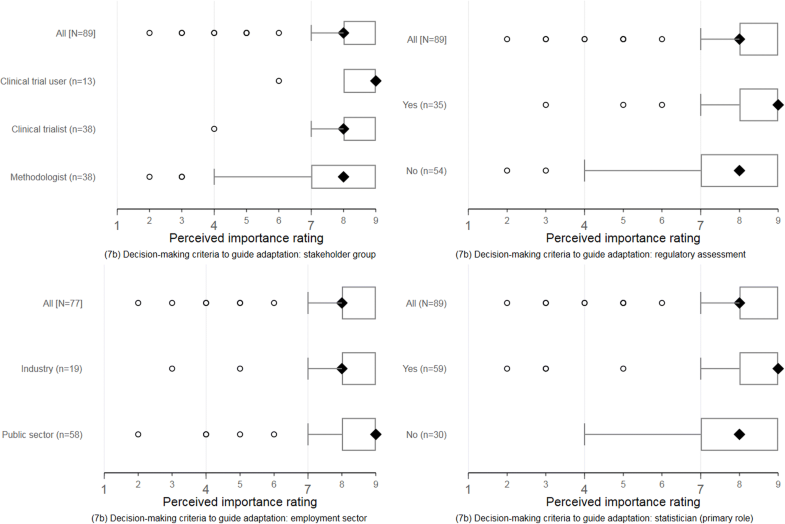 Clustered boxplots showing response patterns in item ratings are accessible online (see download https://doi.org/10.15131/shef.data.6139721.v1). For each item, we calculated the proportion of responders who did not change their item ratings between rounds. The median (IQR) of these item rating proportions was 54.1% (48.6% to 57.1%) with a range of 38.7% to 61.6%. Individual item ratings between rounds were broadly consistent (Additional files 8 and 9). In addition, on average, most responders who changed their rating in round 2 increased scores from round 1 except for items 22b (contribution to future research) and 24e (data monitoring committee charter) (Additional file 9). A summary of the open-ended feedback received in round 2 of the Delphi survey that was reviewed during the consensus meeting is accessible online (see download at https://doi.org/10.15131/shef.data.6139631). Two responders queried whether it was important to identify a trial as ‘adaptive’ in the title. We agreed on the importance of indexing an AD trial as adaptive. However, due to the increasing number of guidelines, it is impractical to mandate keywords in the title for every trial publication. Instead, we decided to recommend the inclusion of the word ‘adaptive’ in the trial abstract or at least as a keyword. This simplifies the search for AD trials in literature databases. A new item 3c (specification of pre-planned adaptation) then captures the details about the AD used. For the main checklist, Table 1 summarises the ACE Consensus Group discussions and advisory decisions made with suggestions of related issues to address. Delegates voted whether to keep or discard each item or whether they were unsure. There was a consensus (≥ 70% of votes) to include ten AD-specific items in the main checklist guideline, of which five were new and five modified items. A further five items were favoured by at least 50% of delegates: AD properties (50.0%), sample size (65.6%), and 53.8% each for randomisation updates after trial commencement (8c), dates defining periods of recruitment (14a), and for the inclusion of the statistical analysis plan (24c). A suggestion was made to expand the explanatory text of the E&E document for six items to clarify additional requirements for some ADs without modifying the item: items 14b (unexpected termination/why the trial ended or was stopped), 15 (appropriate baseline data for comparability), 16 (numbers analysed at interim and final analysis), 17a (primary outcome results), and 20 (limitations, sources of bias, imprecision and deviations) and 21 (generalisability) (Table 1). It was apparent after the meeting that modified item 6b (unplanned changes to outcomes) and new item 14c (adaptation decisions) that were supported by 46.2% of votes for inclusion needed further discussions by the SC (Table 1). Importance of covering both planned adaptations and unplanned changes adequately, as this is key to ADs. Importance of AD properties from a regulatory perspective was highlighted. Noted that statistical and operational properties of the ADs are broad and include sample size. There was a discussion about whether the AD properties should be covered here or under sample size (7a) since the aspects covered by 3e and 7a overlap but not identical. Some suggested this should be under the section heading ‘Sample size and operating characteristics’. Some felt that 3e, 7a, and 7c overlap, so some further work is needed to clarify this. Discussion reflected that a trial could be adapted based on an ‘intermediate’ outcome that may or may not be a secondary outcome. The need for ‘clinical rationale’ was questioned and clarification given as it relates to the rationale for selecting an ‘intermediate’ outcome to adapt the trial or help make interim decisions. Some suggested rewording to ensure that pre-specified primary and secondary outcomes, together with additional ‘intermediate’ outcomes are all adequately covered. The complexity of material covered by this item was acknowledged. Suggestion that it is unnecessary to modify 17a, but rather ensure that new material is all captured under 17c. Queries about whether CONSORT 2010 already covers the relevant content, and whether additional content is just required for the E&E document (similar to items 15a and 16). Highlighted the importance of understanding important changes relative to the feasibility of covering all adaptation aspects within a standard journal article. Importance of transparency about the location of more detailed analyses was suggested as a compromise—it is more about access to key information. Suggestion that reporting of treatment arms that have been dropped should be mandatory. For the abstract (Table 2), there was an agreement to include two modified items (description of trial design and clearly defined outcome for this report) and one new item (adaptive decisions made). A recurrent discussion point was the need to minimise adding new items to the abstract unless they are essential due to word limits imposed by journals. Query about feasibility including detailed AD features in limited word count for abstracts. Debated the use of term ‘adaptive’ in the abstract to help identify these trials; care should be taken as there is a grey area around the classification of some group sequential designs as ADs in some quotas. Some suggested making a distinction between trials where the only adaptation is to stop the whole study and other ADs that must use the term adaptive in the abstract. The E&E could address the scope by highlighting the type of ADs. On 1 February 2018, the SMG met to discuss advisory decisions and suggestions made at the consensus meeting. The group discussed each item reflecting on the consensus report and agreed on the items to retain and structural changes required in the guidance. The advisory decisions and suggestions from the consensus meeting were taken on board. The rationale for an AD (item 3b, Table 1) was dropped as a compromise but will be discussed in the E&E text under item 3c (pre-planned adaptations) and linked to the scientific background and explanation of the rationale (item 2a). We merged items 3e (AD properties) and 7b (sample size) because they are connected. As a result, we renamed the ‘sample size’ subheading to ‘sample size and operating characteristics’. The modified item 6b (unplanned changes to outcomes) with borderline results was included for clarification purpose. In addition, item 14c (adaptation decisions) was discussed as very important and also included for consistency with the abstract decisions. For items 24b to 24f (Table 1), we decided to keep the statistical analysis plan (24c) as an important standalone item and merge to include other items (24b intentionally withheld information, 24d simulation protocol and report, 24e data monitoring committee charter and 24f statistical code) for discussion in the E&E document for good practice. For the abstract, we acknowledged the importance of including a clearly defined outcome used to inform adaptation if different from the primary outcome (1c Table 2). However, for parsimony reasons due to word limit imposed on abstracts, we dropped the modified item but will instead expand the E&E text discussing circumstances when this information is desirable to be included in the abstract. Following the meeting, the checklist was revised including rewording and reordering of some items (such as item 3c ‘specification of pre-planned adaptation’ to 3b ‘pre-planned adaptive design features’) in consultation with the SC. On 13 March 2018, we shared the revised checklist with the ACE Consensus Group for their final feedback on the changes made. On 18 April 2018, we finalised the ACE main and abstract checklists that were signed off by the ACE Consensus Group which will be presented in the forthcoming E&E document. The ACE main checklist contains seven new and nine modified items, as well as six unchanged items that were recommended for inclusion in the expanded text of the E&E document for clarification. The other 21 items remain unchanged from the CONSORT 2010 Statement. The ACE abstract checklist had one new item, one modified item, and an unchanged item with expanded text, as well as 15 unchanged items. Table 3 presents the finalised modifications to the abstract and main report checklists excluding unchanged items. We have developed a consensus-driven extension to the CONSORT 2010 Statement for randomised trials using an AD to enhance transparency and adequate reporting. In the spirit of transparency, we have described in this paper the process for the development of the ACE checklist and provided all supporting information that aided the decision-making process. We hope that our experiences can help others in the development of other guidelines or extensions. The guideline aims to promote transparency and adequate reporting of randomised trials that use ADs and not to stifle design innovation or application of ADs. The ACE checklist provides the minimum requirements that we encourage researchers to report. It is good scientific practice to present additional information beyond this guideline if it helps the interpretation of AD trial results. In principle, we are not advocating the inclusion of details of every trial aspect in a single journal publication. We believe that the most important is the access to details relating to the identified reporting items. For example, researchers can cite other accessible sources of information such as the protocol, simulation protocol and report, a prior publication detailing study design and rationale, methodology publications, and supplementary materials. In addition, the publishing landscape is rapidly changing to meet the needs for more transparency and adequate reporting. During the development process, the SC came across a few reporting aspects that could be changed or added such as on estimands [71, 72] and data transparency but decided not to do so. This is because we felt that changes to reporting aspects that apply to every trial should be managed via universal amendments to the CONSORT 2010 Statement. We did not want the ACE to selectively put additional hurdles on ADs on reporting aspects which would also apply for other fixed designs. We have communicated this decision to the CONSORT Executive Group through its SC representative. The ACE reporting guideline is applicable to all randomised AD trials regardless of the statistical framework used to design and analyse the trials (frequentist, Bayesian, or both). The supporting E&E document to be accessed via the CONSORT  and EQUATOR Network  websites will explain the checklist items in detail with the aid of examples and discussion. The E&E document will guide study publication authors in determining which minimum AD aspects warrant reporting and in what level of detail under different circumstances aided by examples. We hope this ACE reporting guideline will address some concerns about certain AD trials and, consequently, indirectly improve their design, conduct, and interpretability of results. We encourage researchers to use the guideline and journal editors and reviewers to enforce compliance as part of their publication policy. The usefulness of reporting guidelines can be maximised when there are adequate processes in place to enforce their compliance . We used a consensus-driven Delphi methodology recommended when developing healthcare reporting guidelines . We engaged with key stakeholders in trials research and potential end-users of the resultant ACE reporting guideline throughout the development process that involved participants from a wide range of scientific disciplines, employment sectors, and nationalities with diverse AD-related experiences. Throughout the checklist drafting process, an External Expert Panel provided quality control assurances. Given the topic of the guideline, we adapted the development process in response to the feedback gathered. The CONSORT Executive Group through its representative (DA) oversaw the development process of the guideline throughout. This research developed a CONSORT extension for AD randomised trials using this robust approach endorsed by the CONSORT Executive Group. We recorded high response rates of 94 (66%), 114 (73%), and 79 (55%) in round 1, round 2, and across both rounds of the Delphi survey, respectively. The number of registered participants and responders is larger than other similar Delphi surveys [62, 76, 77]. The characteristics and demographics of registered participants and responders were very similar across Delphi survey rounds. In addition, the number of registered participants and responders is larger than in most Delphi surveys used to develop healthcare reporting guidelines [78, 79] and comparable to the one of the latest guideline on pilot and feasibility studies [80, 81]. We also improved the participation of key end-users of the guideline (journal editors) in round 2 by reopening registration after round 1. Finally, we achieved a high degree of consensus that was consistent across Delphi survey rounds for the majority of the items. Additional supplementary materials are publicly accessible (Additional file 10) including participants who took part (Additional file 11). Despite the highlighted strengths of this study, we also identified a number of limitations. First, over half of the survey participants were statisticians in their primary role in trials research and even though industry currently contributes a huge proportion of ADs [18–20, 28, 82], over two thirds of participants were employed in the public sector. However, the secondary roles of participants in trials research were more diverse including clinical investigators and trial methodologists. Nonetheless, perceptions about the importance of items were broadly consistent regardless of the primary roles of the participants, and their self-identified stakeholder group, and employment sector. Second, despite our broad engagement efforts, the number of participants from some stakeholder groups was small such as health economists, regulatory assessors, and research ethicists. Research on obstacles to AD trials also reported poor uptake among these stakeholder groups [26, 28]. The implications for the guideline development are unclear. Paradoxically, although few participants identified themselves as regulatory assessors, about 43% stated that they had AD-related regulatory assessment experiences. This could include researchers with regulatory experiences as part of regulatory engagements or submissions of their trials, previous employees of regulatory agencies, or current regulatory assessors who did not want to identify themselves as employees of regulatory agencies during the surveys due to contractual issues. However, the perceptions of responders were consistent regardless of the stated AD regulatory assessment experiences. It should also be noted that there was only a small number of regulatory assessors available for the sampling frame. Finally, for practical purposes in line with the CONSORT 2010 statement, the ACE reporting guideline applies to randomised trials that use ADs. Hence, the guideline does not specifically address reporting aspects of non-randomised AD studies that are also applied in early phase trials. Nevertheless, the basic principles of the ACE reporting guideline may still be applicable to these interventional studies and are consistent with some researcher good practice propositions for writing early-phase AD study protocols . We believe there is scope for a consensus-driven approach to develop a reporting guideline for non-randomised AD studies. We have developed a consensus-driven CONSORT extension for AD randomised trials. This paper transparently describes how we reached the final ACE reporting checklist and the forthcoming E&E document and provides all supporting information that aided the decision-making process. The process we described is not just applicable to ADs, and so we hope this will help researchers in the development of future guidelines or extensions to learn from our experiences. The ACE reporting guideline is applicable to all AD randomised trials and contains minimum reporting requirements with appropriate flexibility to be described in the E&E document. We hope the guideline will improve the reporting of AD randomised trials, enhance their interpretability and credibility of their results, improve their reproducibility, and indirectly facilitate their robust design and conduct. 1. The risk of introducing operational bias into the conduct of the trial increases when interim data are reviewed. 2. Performing multiple hypotheses tests increases the risk of making inappropriate or unjustified claims about the treatment effect if inappropriate statistical methods are used. This occurs for example when conducting interim analyses; evaluating multiple patient subgroups, treatments, or endpoints; or a combination of these. 3. Not addressing planned adaptations and unplanned changes may potentially invalidate results depending on their form, purpose, and the statistical methods used. 4. Biased estimates of the treatment effect may be produced if inappropriate statistical methods are used for analysis. 5. The risk of making undesirable trial adaptation decisions based on premature or inadequate interim data. 6. The type of adaptive design, form of trial adaptations, and interim adaptation decision rules used may influence the acceptability of results, level of information to disclose, and the applicable statistical methods. 7. Unintended changes in patient characteristics or the estimand (what is to be estimated) before and after trial adaptation may occur, making overall results difficult to interpret. 8. The need for more transparency to enable research consumers to evaluate the appropriateness of the methods, sources of potential bias, and interpretability and trustworthiness of the trial results, as well as to enable other researchers to reproduce trial-related aspects. Douglas G. Altman is deceased. This paper is dedicated to his memory. The SC valued the administrative support provided by Sarah Gonzalez throughout the project and additional coordination. The authors acknowledged Sheffield Clinical Trials Research Unit for the support, particularly Mike Bradburn and Cindy Cooper for providing protected time to ensure progress of this project; Benjamin Allin and Anja Hollowell for the Delphi surveys’ technical and administrative support; and Peter Bauer and Martin Posch for their helpful review feedback of the draft checklist. We would like to thank these members for their invaluable contributions in reviewing the checklist and working definitions of technical terms for the Delphi surveys: William Meurer a, Yannis Jemiai b, Stephane Heritier c, and Christina Yap d.
We are very grateful to the participants who contributed to a very successful consensus meeting that influenced the decision-making process of the SC. All members including the SC signed off the final ACE checklist. We would like to thank all the participants who took part in the Delphi surveys. This was time-consuming, and we acknowledge their immense contribution to the guideline development process. Additional file 11 lists registered participants who did not opt out for their names to be publicly acknowledged. This paper summarises independent research jointly funded by the NIHR CTU Support Funding programme and the MRC HTMR. The views expressed are those of the authors and not necessarily those of the National Health Service, the NIHR, the MRC, or the Department of Health. The funders had no role in the design of the study and collection, analysis, and interpretation of data and in writing the manuscript. This work reflects the views of the authors and should not be construed to represent FDA’s views or policies. MD, JW, TJ, AM, ST, SJ, FK, CW, DH, and JN were co-applicants who sourced funding from the NIHR CTU Support Funding programme. MD, JW, and TJ sourced additional funding from the MRC HTMR. TJ’s contribution was in part funded by his Senior Research Fellowship (NIHR-SRF-2015-08-001) funded by NIHR. NHS Lothian via the Edinburgh Clinical Trials Unit supported CW in this work. The University of Sheffield via the Sheffield Clinical Trials Unit and the NIHR CTU Support Funding programme supported MD. Additional file 10 details additional supplementary material accessible via the University of Sheffield ORDA repository. This includes anonymised individual-level datasets generated from Delphi surveys reported in this study. Please contact the lead author for any related queries. The idea originated from an NIHR Doctoral Research Fellowship (DRF-2012-05-182) led by MD and supervised by SJ, ST, and JN. The idea was presented, discussed, and contextualised at the 2016 annual workshop of the MRC HTMR ADWG attended by six members of the SC (MD, TJ, PP, JW, AM, and CW). MD, JW, TJ, AM, ST, SJ, FK, CW, DH, and JN conceptualised the study design and applied for funding. All authors contributed to the conduct of the study and interpretation of the results. MD analysed quantitative data. EC analysed qualitative data, and MD assisted with technical interpretation. MD, EC, ST, PP, CW, TJ, JW, and SJ led the write-up of the first draft. DA on behalf of the CONSORT Executive Group oversaw the whole development process. All authors contributed to the write-up, reviewed, and approved the final manuscript version. However, we are deeply saddened by the passing of DA who did not have the opportunity to approve the final manuscript. In memory of his immense contribution to the ACE project, medical statistics, good scientific research practice and reporting, and humanity, we dedicate this work to him. The project ethics approval was granted by the REC of the ScHARR at the University of Sheffield (ref: 012041). All Delphi participants provided consent online during registration. Jaki T. Designing multi-arm multi-stage clinical studies. Developments in Statistical Evaluation of Clinical Trials. Springer; 2014. p. 51–69. Available from: http://link.springer.com/10.1007/978-3-642-55345-5_3. Dimairo M. The utility of adaptive designs in publicly funded confirmatory trials. 2016. http://etheses.whiterose.ac.uk/13981. Accessed 7 July 2017. Detry MA, Lewis RJ, Broglio KR, Connor JT, Berry SM, Berry DA. Standards for the design, conduct, and evaluation of adaptive randomized clinical trials. Washington: Patient-Centered Outcomes Research Institute; 2012. http://www.pcori.org/assets/Standards-for-the-Design-Conduct-and-Evaluation-of-Adaptive-Randomized-Clinical-Trials.pdf. Accessed 7 July 2017. The EQUATOR Network [Internet]. [cited 2016 Oct 10]. Available from: http://www.equator-network.org/reporting-guidelines/. Extensions of the CONSORT Statement [Internet]. [cited 2018 May 21]. Available from: http://www.consort-statement.org/extensions.